Pro-Kurdish Peoples' Democratic Party (HDP) group deputy chairwoman and Iğdır deputy Pervin Buldan paid a visit on Sunday to the family of a PKK terrorist recently killed by Turkish security forces in the Lice district of southeastern city Diyarbakır. She tweeted a photo from the commemoration of the terrorist, with a note which said "We are attending the commemoration of Şoreşger who was martyred in Lice." 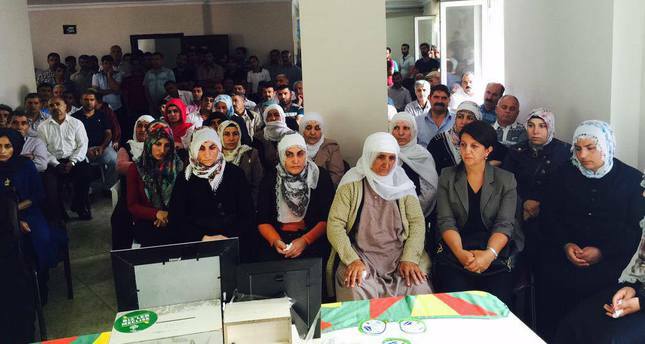 Buldan attended the commemoration of another PKK terrorist who was killed in northern Syrian town of Kobani. In the tweet she shared from the commemoration, she said "We are attending the commemoration of Berxwadan who was martyred in Kobani." HDP deputies and the party itself came under heavy criticism many times for their affiliation with the PKK terrorist organization. According to the National Intelligence Agency (MIT) report, Pervin Buldan's husband Savaş Buldan, who was found dead in Bolu in 1994, was involved in many activities in line with the PKK. The Public Prosecution Office launched a trial against him in connection with the incidents that took place in Yüksekova, Hakkari, in March 1979. In 1980, Savaş Buldan sheltered some militants of the PKK in his house after clashes that occurred between the PKK and another terrorist organization of the time, the Kurdistan National Liberators (KUK), in the Kızıltepe district of Mardin and Diyarbakır. In 1986 he married his cousin Pervin Buldan. In June 1992, when he was living in Istanbul, he got involved in drug trafficking and transferred most of his income to the PKK. Along with the group deputy chairwoman Pervin Buldan, HDP's co-chair Selahattin Demirtaş also draws criticism for having links to the PKK. Selahattin Demirtaş's brother, Nurettin Demirtaş is a member of PKK. After a Turkish daily published photos of his brother in a PKK camp with other militants, Demirtaş said that his brother "Protects the honor of humanity" as he is fighting against ISIS in Syria. The Turkish government has intensified its counterterror operations following the recent attacks carried out by the PKK, which is recognized as a terrorist organization by the U.S., the EU and Turkey. Formed in 1978, the terrorist group has been fighting the Turkish government for an independent state until the early 2000's. The group then shifted its goal to autonomy in predominately Kurdish inhabited regions of Turkey. The PKK announced on July 11 that the cease-fire which was declared via a message from the PKK's imprisoned leader Abdullah Öcalan in 2013 has ended.